Ok, the superior watch makers at Breitling have done it, again. Wow! That is the reaction I had, and I’m sure you will have, when you get a look at the newest creation from this authoritative watch maker. The Breitling Chronomatic Diamondworks watch was recently unveiled, and isn’t it spectacular. The 01 Chronomatic Diamondworks is the 2nd generation of the Chronomatic watch, which was produced in 2009. Looking over the original Diamondworks, it’s hard to believe that Breitling could raise the bar any higher, but they have. The 01 Chronomatic Diamondworks is dripping in 18 carat rose gold and diamonds. The setting of the diamonds is one of a kind, as is the movement which runs the timepiece. 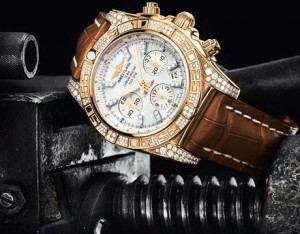 The powerful automatic winding mechanical movement is one of Breitling’s proprietary innovations. Breitling, leaders in their industry, have infused this watch with some surprising and unique design elements. The Diamond setting is like nothing you’ve ever seen before. The diamonds which mark the hours are displayed in a double row, atop a beautiful Mother-of-Pearl dial, and the bezel diamonds are meticulously integrated with numerical carvings, giving off an almost hieroglyphic appearance. There is no way to mistake this for any other, than a Breitling. The combination of exceptional horologic design and superior craftsmanship give this watch real collector appeal.